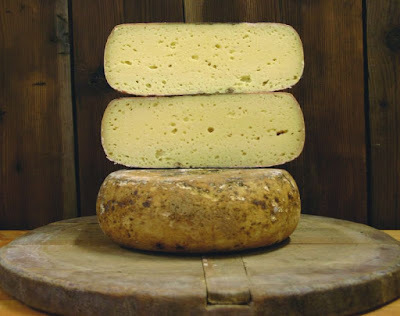 This italian DOP cheese is produced with cow's milk derived from herds located in Valle d'Aosta, obtained in accordance with specified requirements relating to the production standards from wich the diet of the cows, that must be predominantly of local fresh grass or hay. It can also be flavored with juniper barries, caraway seeds or fennel. The Fromadzo cheese has acquired the DOP certification in 1996. The logo represents a stylized cow, which color changes depending on the type of product: green for low-fat, natural for the medium fat, blue if is added goat milk, pink if the milk is pasteurized, yellow if the milk is flavoured with herbs or spices. As for external appearence, the crust of Fromadzo is consistant, the color is yellow tending to gray with possibile reddish tones. The paste is compact with small and medium holes. The taste is slightly sweet if fresh, slightly salted if and sometimes with a hint of chili if seasoned. The Fromadzo cheese is excellent accompained with pumpernickel bread if consumed fresh, or grated to enhace the taste of soups and pasta if seasoned. It goes nicely with local red wines.